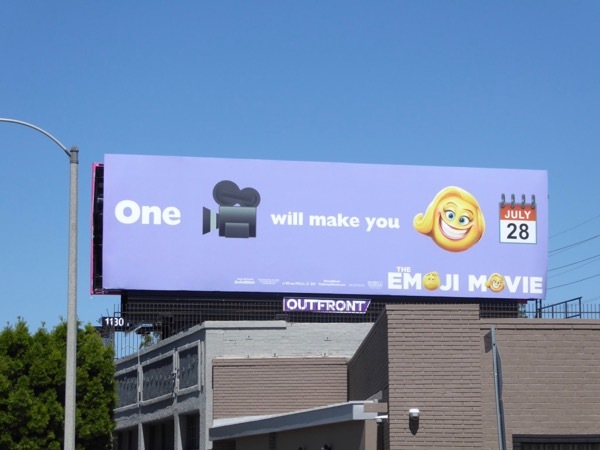 What better way to start another working week than with these witty billboards for The Emoji Movie to put a wry smile on your face. 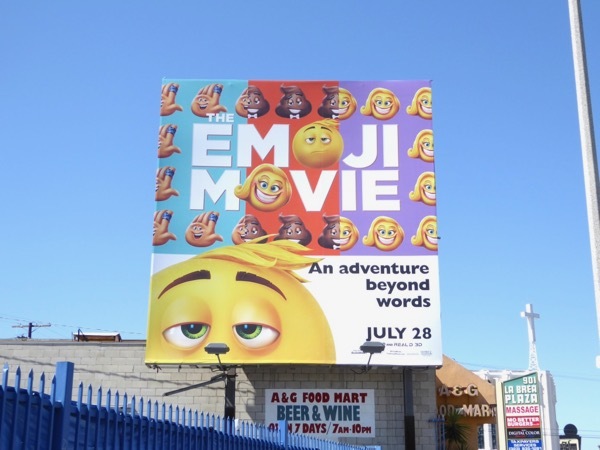 In the brave new social media world we live in of texting, snapchatting and conveying our opinions in 140 characters or less, there's never been a better time to launch an animated feature film based on the images and icons used to express your feelings, ideas or activities. 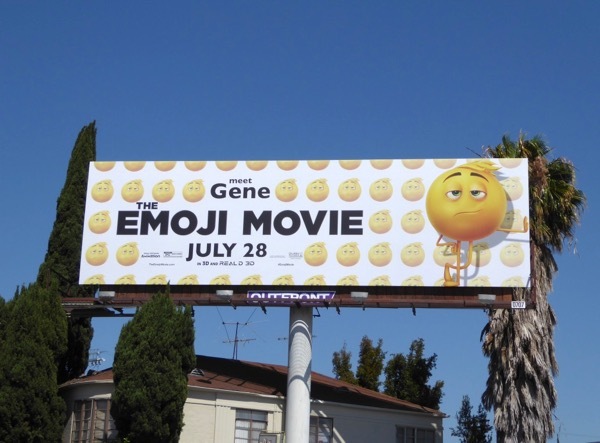 In the secret world of your smartphone, T.J. Miller voices 'Gene', a multi-emotional emoji within the massaging app city of Textopolis who sets off on a journey to become a 'normal' one-dimensional, one-expression emoji like everyone else around him. 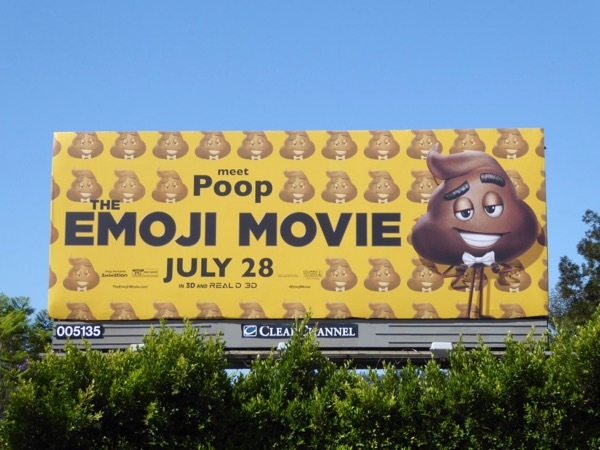 The film also stars the voice talents of May Rudolph, James Corden, Anna Faris and in the best casting ever, thespian Sir Patrick Stewart as the 'Poop' emoji. 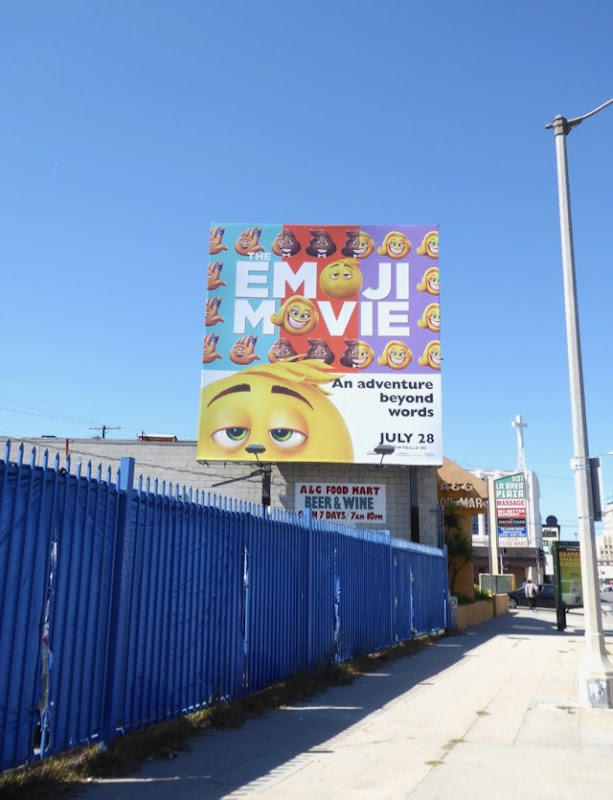 These colourful billboards were spied along the Sunset Strip, La Brea Avenue, Westwood Boulevard, Sepulveda Boulevard and Pico Boulevard from May 11 to May 20, 2017. 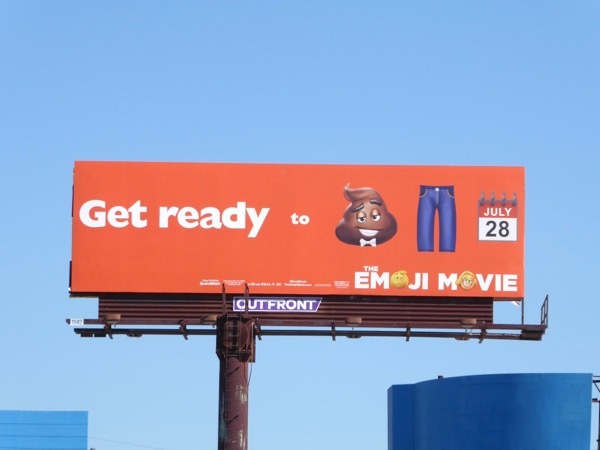 However for a family-friendly film these poop-filled ad creatives do seem quite adult-themed when you think about it, but at the end of the day you have to get the adults to bring their kids. 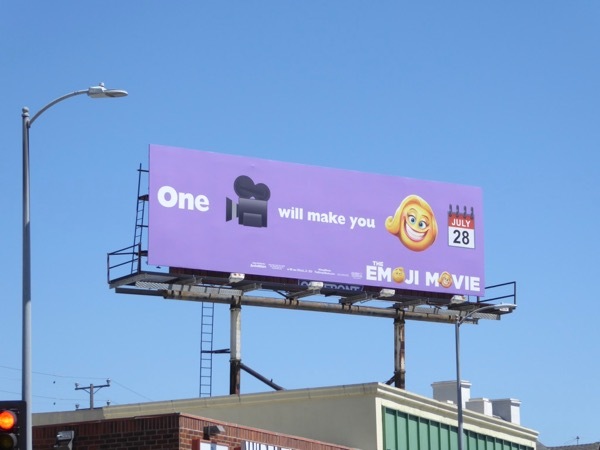 This may be a really funny outdoor ad campaign, but have we as audiences become so starved of entertainment and has Hollywood become so desperate for new ideas that we even need a movie based on emojis? 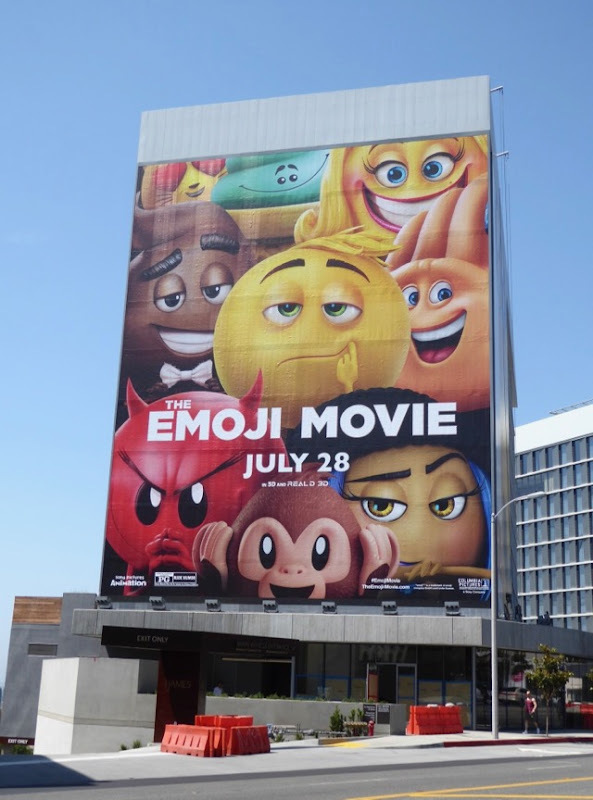 We suppose it was inevitable after The Angry Birds Movie, but what does the future hold next? 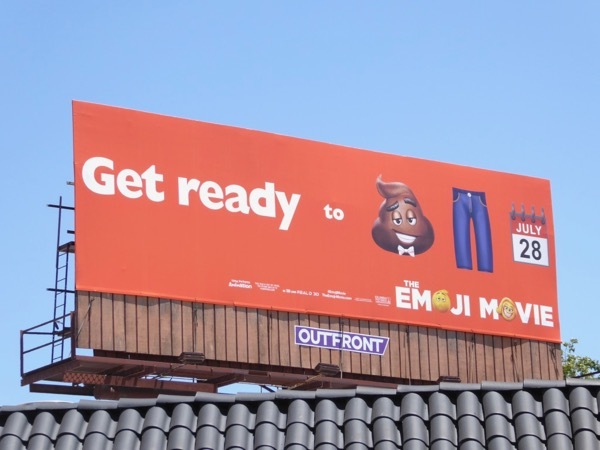 For more emoji-themed ad creatives be sure to also check out this hilarious Deadpool movie billboard, this fun Key & Peele season five billboard, these Ellen talk show billboards and these foodie Postmates billboards. 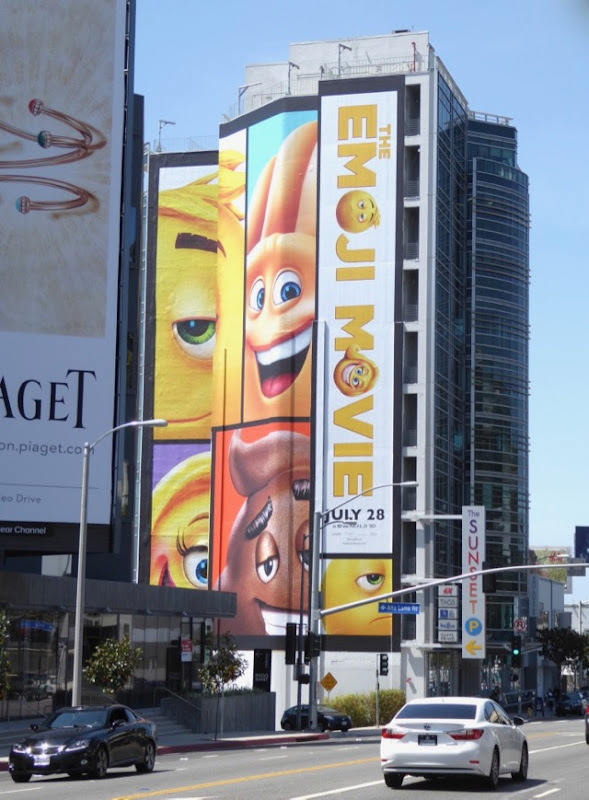 With the animated movie opening at the end of July, we're sure there's still more billboards to be seen, so watch this space. 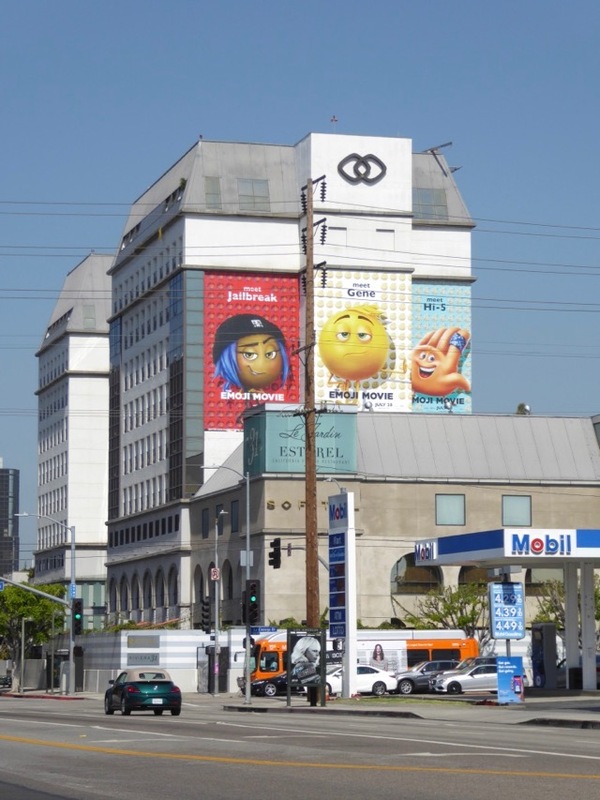 The teaser billboards for The Emoji Movie arrived early in the city skyline to raise awareness and create interest, so it's nice to see another wave of ad creatives for the animated film hitting the streets and skies of L.A. closer to the release date. 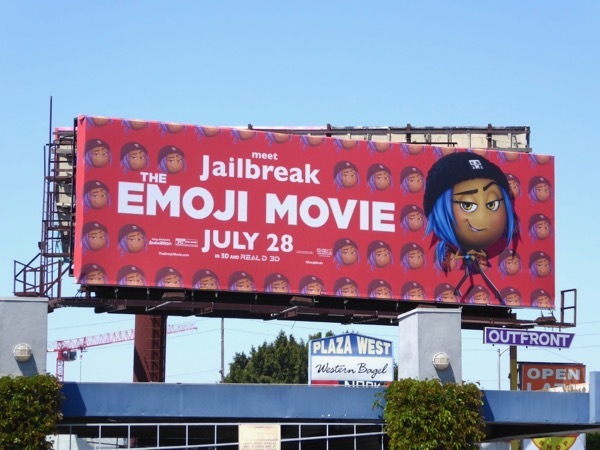 This time around emoji characters like 'Steven' and 'Jailbreak' also get their turn in the out-of-home spotlight. 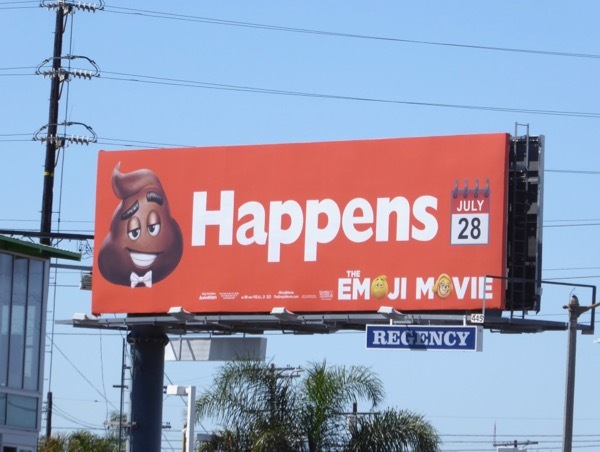 But as before it's the bow tie-wearing 'Poop' emoji that steals the show once again with his latest billboard. 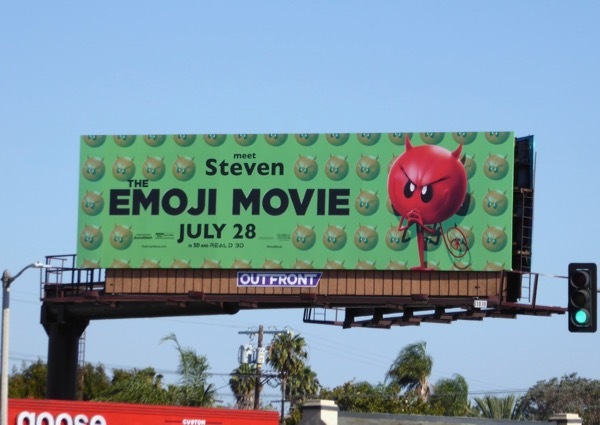 Daily Billboard is sure these examples spotted along La Cienega Boulevard, La Brea Avenue, Barham Boulevard and Santa Monica Boulevard on July 4, 2017, won't be the only outdoor ads we spot in the coming weeks, so we'll be sure to keep our eyes to the skies. 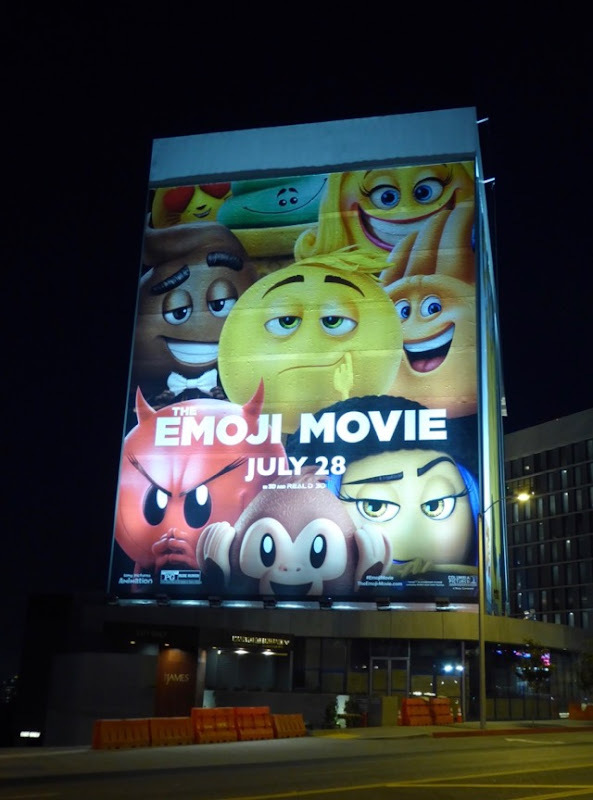 Meanwhile here's another giant-sized billboard with all the animated emoji gang by day and night. 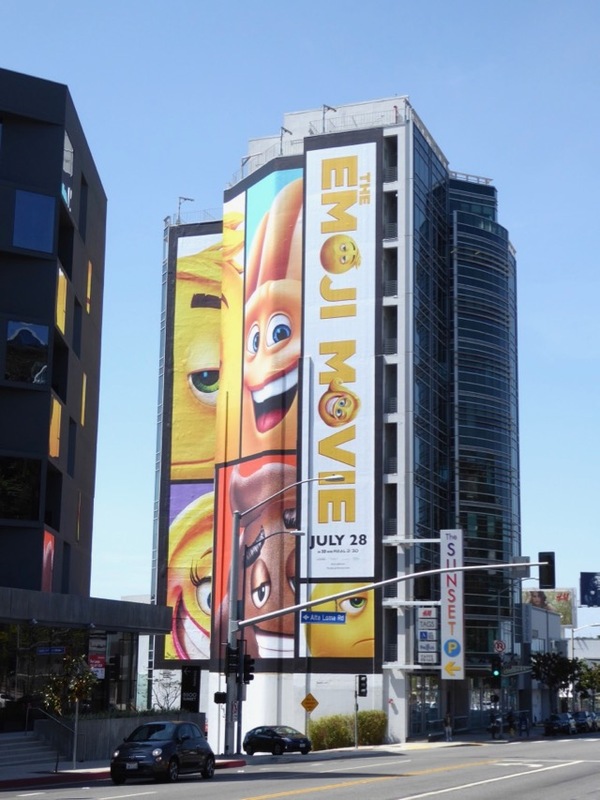 This super-sized ad creative was snapped along West Hollywood's heavily trafficked Sunset Strip on July 5, 2017. 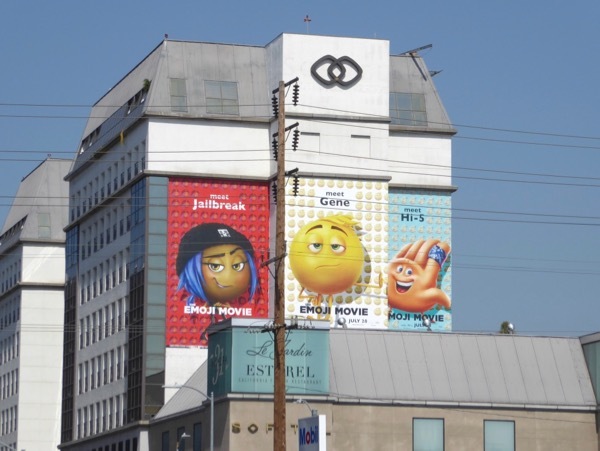 UPDATED: Here's another super-sized ad creative for the computer-animated movie snapped on the side of the Sofitel Hotel along Beverly Boulevard on July 8, 2017. 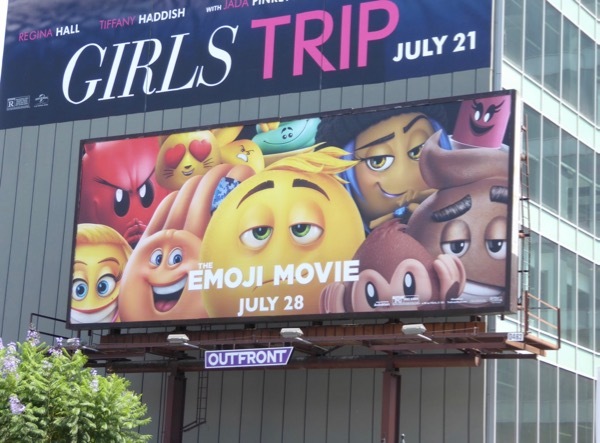 Let's hope all this ad spend pays off and that audiences can put down their smartphones for long enough to watch The Emoji Movie. 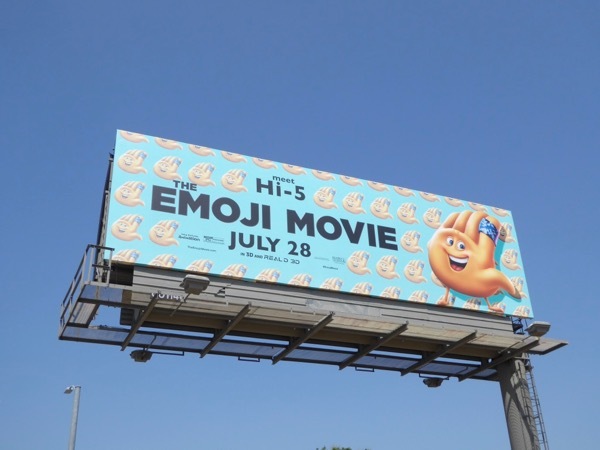 UPDATED: Here's another landscape billboard for the film snapped along Highland Avenue on July 10, 2017. 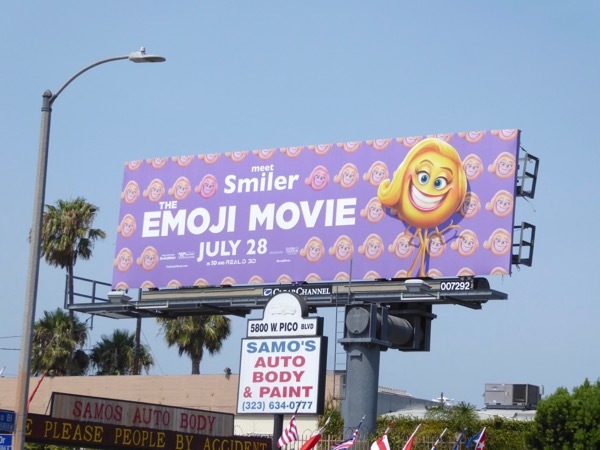 Plus not to be left out, here's also 'Smiler' in the spotlight in her own billboard spotted along Pico Boulevard on July 12, 2017. 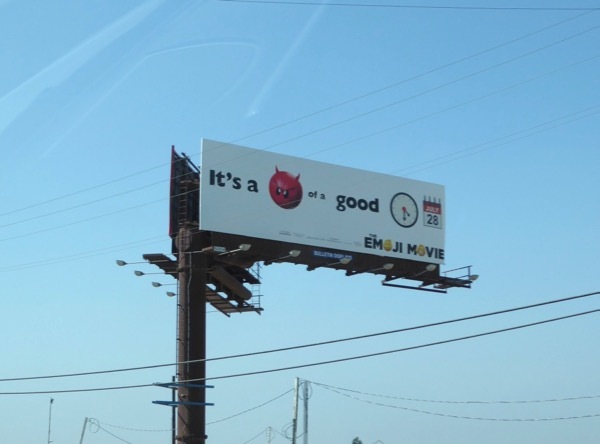 UPDATED: Meanwhile this 'It's a devil of a good time' emoji billboard was spied along the I5 freeway on July 14, 2017. 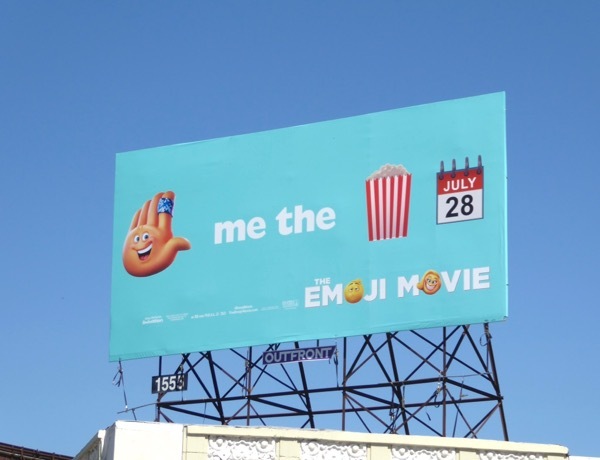 Plus here's 'Hi-5' waving to passersby along Olympic Boulevard on July 21, 2017.